“Act of Parliament” (or “statute” or “legislation”) is a law made by Parliament. For example, the Environment Protection and Biodiversity Conservation Act 1999 (Cth). When an Act is presented for consideration by Parliament and before it is passed by Parliament, it is known as a “Bill”. Queensland Acts are available here. “Amendment” refers to a change in an Act of Parliament or a statutory instrument. Where new sections are inserted they are often numbered with a capital letter to avoid re-numbering subsequent sections (e.g. where two sections are inserted between ss 20 and 21, they might be numbered ss 20, 20A, 20B, 21). The “common law” is the body of legal rules developed by binding decisions of courts. Australia, Canada, New Zealand and the USA all inherited the common law tradition from England. In countries that do not adopt the English legal system, such as France, Russia and China, there is less reliance on decisions of the courts. However, in common law countries there is now heavy reliance on legislation/statutes/Acts of Parliament. Most environmental law is contained in legislation. Legislation may change or override the common law. “Environment” is a protean term as it readily assumes different forms and characters but it is defined here to mean the natural and human-made world, excluding economic and social matters. This includes: the ecosystem (including biodiversity and natural resources); all areas and structures modified or built by humans; and all factors affecting human health and the quality of human life (including cultural heritage and amenity). “Environmental law” and “environmental regulation” are used inter-changeably to refer to the body of law that regulates human impacts on the environment. Environmental law includes, but is not limited to, traditional categories such as environmental protection, conservation, pollution, mining, fisheries, cultural heritage, environmental impact assessment, and planning and development laws. It is a very wide area of law without precise boundaries. “Environmental regulatory system” or “environmental legal system” is the combination of environmental law with the government departments, local governments, courts and other bodies that administer it within a particular jurisdiction or geographic area. It includes the decision-making processes, policies, practices and constitutional constraints that affect the administration of the law. There are normally multiple layers of law and administration within any environmental legal system. These layers typically include international, national, regional/state and local laws depending on the governance and constitutional arrangements of the particular jurisdiction. “Law” is the rights, duties, powers and liabilities contained in international treaties, customary international law, domestic legislation, and the Common Law. 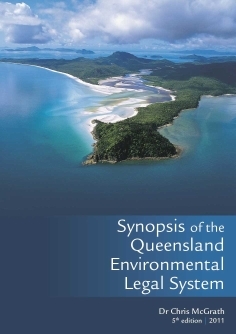 Most environmental laws in Australia are contained in legislation and subordinate laws and instruments such as regulations and planning schemes. “Legislation” – see Act of Parliament. “Parliament” is the body that makes legislation. At a federal level in Australia there are two houses of Parliament, the House of Representatives and the Senate. At a state level Queensland has only one house of Parliament, known as the “Legislative Assembly”. See also – Separation of Powers. “Policies” are positions taken and communicated by government that recognise a problem and in general what will be done about it (1). For example, a widely accepted environmental policy is a commitment to ecologically sustainable development through integrating environmental considerations into decision-making. Command and control laws (or regulation) involve laws backed by sanctions to prohibit or restrict harmful activities. A common regulatory approach is to prohibit an activity by making it an offence unless it is approved by government. This forces people to gain approval if they wish to undertake the activity and government can typically control how the activity is conducted by imposing conditions on the approval. Economic instruments are primarily based on using positive and negative financial incentives rather than direct government control, including enforceable property rights, a trading market, or taxation (e.g. the Australian emissions trading scheme for greenhouse gases). These instruments are typically backed by legislation/law. Government funding for research into an environmental problem or to support community action such as land rehabilitation. Education and information instruments include such things as education and training, corporate environmental reporting, and pollution inventories. Self-regulation involves industry or professional associations controlling the conduct of their members without direct government control. Voluntary measures involve individuals undertaking to do the right thing without any basis in coercion from government, industry or professional bodies. “Regulation” and “regulatory system” are used interchangeably with the words “law” and “legal system” to refer to the system of laws that regulates human activities. In the appropriate context, “regulation” or “regulations” is also used to refer to an important type of subordinate legislation. “Section” is the most common name for an individual provision of a statute or statutory instrument. The normal abbreviation for a section is “s” and for sections is “ss”. Lower levels within a section are typically referred to as “subsections”, “paragraphs” and “Roman numerals” (e.g. s 75(1)(a)(i)). “Separation of powers” is a doctrine that divides the institutions of government into three branches: legislative; executive; and judicial. The legislature (the Parliament) makes the laws; the executive (the government) puts the laws into operation; and the judiciary (judges appointed to the courts) interprets and resolves disputes according to law. In Australia there is not as clear a separation between the three limbs as in the USA and some other countries. At a federal level in Australia, the leader of the party that controls the lower house of Parliament is the Prime Minister and he or she appoints ministers to head the executive government comprised of the Commonwealth public service and organised in different departments (normally collectively referred to as “the government”). At a state level, the leader of the party that controls the Parliament is the Premier and he or she appoints ministers to direct the executive government comprising the Queensland public service. “Statute” – see Act of Parliament. “Statutory instruments” are, subject to some exceptions, any document made under the authority of an Act of Parliament, including subordinate legislation (3). The most common type is a “regulation”. Other less common types are “local laws” and “ordinances” made by local governments. Regional plans, state planning policies, and planning schemes created under SPA are statutory instruments that have the force of law (4). “Subordinate legislation” is a class of statutory instrument, the most common type of which is “regulations”. Generally, legislation/statutes/Acts of Parliament create the broad frameworks for a particular area of law, such as planning law contained in the Sustainable Planning Act 2009 (Qld) (SPA), while regulations provide administrative details within that framework. For instance, section 578 of SPA makes it an offence to carry out assessable development without an effective development permit. Schedule 3 of the Sustainable Planning Regulation 2009 (Qld) sets out dozens of types of development that are assessable or self-assessable development at a State level under the SPA. “Treaty” (also often termed “convention”) is an international agreement between two or more countries. For example, the United Nations Convention on Climate Change, done at Rio in 1992, is a major international treaty dealing with climate change. (1) See Dovers S, Environment and Sustainability Policy: Creation, Implementation, Evaluation (The Federation Press, Sydney, 2005), pp 12-15; Althaus C, Bridgman P and Davis G, The Australian Policy Handbook (4th ed, Allen & Unwin, Sydney, 2007). (2) Adapted from Gunningham N and Grabosky P, Smart Regulation: Designing Environmental Policy (Oxford University Press, 1998), p 38. (3) For Queensland, see the Statutory Instruments Act 1992 (Qld). (4) Sections 24, 41 and 80 of the Sustainable Planning Act 2009 (Qld).